Bad as situations present themselves, it's the widespread reaction that does the awake in. A paradox in caring it matters, while struggling over the vanity and taking action. What's a Christian to... do? Bible is the main source for God reaching us. Somehow keeping our lights-on and here is crucial. A battle to achieve page-opening victory in. All about getting this, more-than-literature, into us. Seeds for planting with the outcome in harvesting promised. Word in: Word out. So the world goes. Why the depths and levels of mess? On the positive; for social -- allowing Gospel go forth -- betterment. Corresponding, in what holds-back and we don't get much worse. What can move the need-to mountains as we're pushed into the cult's A.I. weaponised experiments? Feast or famine on the farm and lots, or little, food produced. 'Farmers' are bang into talking about, telling a crowd, bitching about this or that 'other lot'. Meetings and platforms. Paperback and DVDs. Yet, none of this by definition is anything but lower-level activity. If and that? 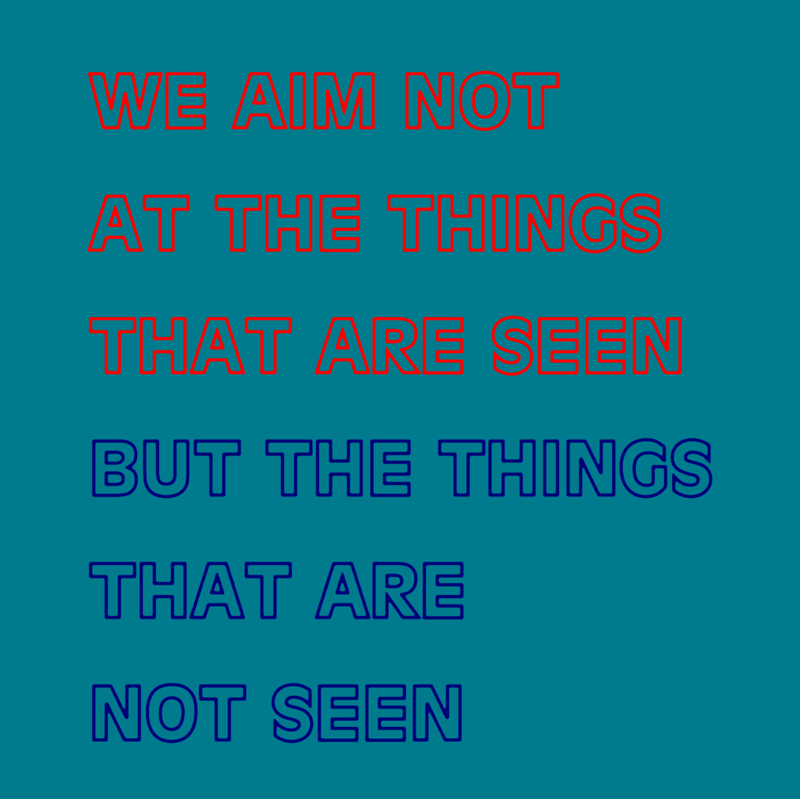 What we see and outward is not for sure, causing so much going on. Yes, more of the same looks lively but isn't an accurate equation. Cannot easy assess and all that stares out and struts in churchianity is alive. Or, those less into being group-associated and lone bods. Seen on videos in the main, think, putting right church-wrongs. Again, might or might not, be much use? The right-lasting and counting are that with an 'eternal' touch or weight. Discernment here is not always self-evident and visual. The birds and the rock and weeds are stealing and killing the crops. We don't 'see' this but said a-happening. Can realise. Can get the results. Far too much about the seen. Wherein and difficult and time-drudging dragging, sheer seems hard and action-less is solitude. Might be a song and a shout. Read out and look into. But all about the word alive. The fix our eyes... up and in this application. Actions unseen -- generally speaking, unless in a prayer meeting -- are more likely of the 'eternal' and value. The gifted to all, who call on and for 'eternal life' working 'in the world'. For people, and for good. It's about another kind of life and here now. New life in quality and present when able to be open to. Talking or writing about the Bible isn't in itself sign of the heat. More, the words themselves. With whatever messaging, believe and receiving -- coming out of a scriptural punch. The verse or verses, carrying a germinating power. The dynamism that arrests and enlivens. Likely surprise. The Bible says...'this'. Wow. What? Simple as -- could be, but bites or hits. Warmed my heart and a good strange, as Wesley wrote, of an initial encounter. If, and to any extent doing something on these plant-a-seeds, would-that it should stir the reader to open the book. The self-perpetuating cause; Read the Bible to achieve the main goal... want to read it, some more. Hence the obsessive sounding within the pages and 'day and night' and living-in these words. Seems mad it matters so but it's what's claimed. The saints -- which, we all are, if 'in' Christ -- of old, the best of and causing, seems most holy havoc, attest to this. Say they put praying tops and reading along and within the exercise the dual pounding act. Heard of later-life nuggets and regret and spending too long in the study of. Pouring over commentaries and original language. Likely in pursuit of jumping on a pulpit, or what YouTube have you, these days. Recognising that devotion and direct attention has no substitutes. For many thinky types, studying is fast-track satisfaction and stimulation. A downside is it's more often competitive about alternative Christian-based theology. A kind of evangelism turned inwards. 'Can't win outsiders' goes the line, so better-off try wins around other Christians. To 'our' reckon, most orthodox brand. To 'our' Pope's and Church Father's. To a person upfront on a stage with novel pumping eureka latest hip revelation. While God present to intervene and achieve, more than we're often aware. Depends on attitude and openness. Enough nous to get into accepting, the accepting one, loves this much. The Gospel and news, are the verses themselves, combined with traditions and reason. Traditions, come teaching, can cause all sorts of troubles and idolatry. Along with, ought to bring and should be, light. Two recent, listening to others, struck me. Kevin B. talking 'total depravity' and 'penal substitution' and sum up of Christianity. Users of this phrase, always an addendum to something going wrong and the implication, all 'meant to be'. One, why Jesus isn't seen. Make 2 Cor. 4 the days stick it on me and in me -- bit. May you find yours and spit out and sow.